I first heard about commodities futures in the last bear market. In 2002, commodities futures returned something like +25-30% while the S&P lost 22%. People were saying back then commodities futures were a great investment because they had “equity-like” returns while being uncorrelated with the stock market. This characteristic would add diversification to one’s portfolio and at the same time not reduce its return like adding bonds would do. PIMCO introduced a commodities futures fund for retail investors in 2002. I wasn’t so convinced by the story. In my mind I had always associated commodities and futures with speculation. I also thought people were chasing performance while justifying it by saying they were doing it for diversification. Since then, commodities futures funds had very good returns, all the way through the summer of 2008, driven by rapidly increasing prices of oil, agriculture products and metals. I was watching on the sideline thinking somehow I missed the boat. Then it crashed down hard. 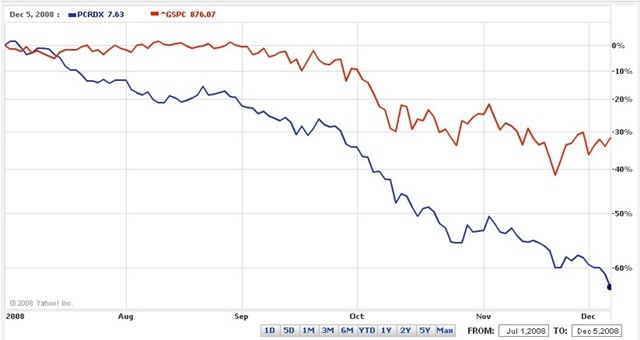 In a period of about five months, the price of the PIMCO fund dropped over 60% (blue line is the PIMCO fund; red line is S&P 500). PowerShares DB Commodity Index Tracking Fund (DBC) – Only six commodities, 55% in energy. iShares S&P GSCI Commodity-Indexed Trust (GSG) – many commodities but 68% in energy. iPath Dow Jones-AIG Commodity Index Total Return ETN (DJP) – ETN brings credit risk from the issuer. I don’t want to take that risk. The PIMCO fund D share is more expensive at 1.24% expense ratio but it requires a low $1,000 initial investment. It’s also no-transaction-fee (NTF) from most brokers. Because I’m only starting with a small amount in an IRA, the extra expense ratio isn’t much in actual dollars. When I accumulate more in this fund, I can exchange it to the less expensive Institutional share (PCRIX) which is available at Vanguard for $25,000 initial investment. The price I paid was about $5.61 a share after adjusting for year-end distribution (story about that one forthcoming). So far it’s up 5% already. Let’s see where it goes from here. If you’d like to learn more about commodities futures, there are a ton of papers linked in the Bogleheads Wiki article on commodities. * The purpose of this post is to document what I was thinking when I added this new position to my portfolio. It’s not a recommendation for anybody else to do the same. I’m trying to do a some more research myself on whehter or not to add CCFs to my portfolio. You write that you associated CCFs with speculation and that people were performance chasing and then went on to write about the crash so you bought in but didn’t mention what changed your mind about CCFs. Is it because it is much cheaper relative to the SP500? Do you now believe that CCFs do offer a true diversification benefit? Thanks TFB. simplesimon – As I educate myself more on this subject, I think there are both a diversification benefit and speculation in commodities futures. I don’t want to do it when it’s really hot because I don’t want to pay a good price premium for the speculation component. Think International Real Estate. It was a hot topic last year. You don’t hear a thing about it now. Right now the diversification benefit of commodities futures is still there. Only the price is cheaper. It’s hard to tell how much is diversification and how much is speculation. I only hope the speculation component isn’t as much as it was before. I’m still new to this. Experts always have different opinions. Just the other day there was an article about commodities futures having a -20% outlook in the next 12 months. Who knows what will happen. I’m starting slow. What do you say to the argument that commodities are now correlated with stocks, and are thus not really another asset class in and of themselves for diversification? I’ve read a couple articles in the last month or so that have commented that people thought they were diversifying into commodities only to find that they’ve acted in concert with the overall economy. Jim – Like I said in my reply to simplesimon, experts have different opinions. For each argument for it, you can find argument against it, and vice versa. I’m still new to this and I’m only getting my toes wet, not jumping in blindfolded. Of course commodities are related to economic activities, but they are not necessarily related to the stock market. We have stock market declines to the tune of 40% – 50% in 2008. The economic activities certainly didn’t decline by 40% – 50%. Correlations change from time periods to time periods. If they have become correlated now, who knows whether it will stay that way or become uncorrelated in the future? For the time being, I’m willing to accept the arguments from the pro- camp. It seems that people could end up paying tax for (some) gains from commodity ETFs in their IRA accounts. comate – I didn’t get the impression from reading that article people could end up paying tax from gains from commodity ETFs in their IRA. The article made no mention of IRA at all. I’m not even sure it is accurate that people will receive a K-1 form from their commodity ETF. Correlation is often misunderstood and not applied appropriately. I am not and don’t profess to be an expert, but I do know that you will get widely different results depending on several factors. For example if you calculate the correlation between Dow Jones AIG Commodity Total Return Index and S&P 500 from 2/28/91 thru 11/30/08 using monthly returns you will get 0.19, using quarterly returns 0.24. If you calculate the correlation using the trailing 12 months it is 0.43, trailing 36 months it is 0.42, and trailing 60 months 0.39. If you use the 12 month moving average it is 0.09, 36 moving average it is 0.10, 60 month moving average it is 0.10. What is the best way to buy these NTFs? Vanguard charges a $30 a year fee for their brokerage component. Zecco does not offer this? Any free/cheap option to buy this fund? Arvind – Fidelity, Schwab, E*Trade, and TD Ameritrade all have PCRDX as a NTF fund. It’s been about 1 year since your initial post on CCF. Can you give us an update? Do you still hold PCRDX? Have there been rebalancing opportunities?